Is something bugging you? We know exactly what the problem is—creepy crawly critters. If you have unwanted "guests" in your home, allow our licensed technicians to provide fast and effective rodent control in Miami, FL. We use the right techniques and high-quality products to rid your home of these unwelcomed tenants. You don’t want them in your home, and we don’t either. Our company has been helping families safely and effectively live pest-free for many years. We specialize in both residential and commercial rodent control. We’ve been in business for more than 10 years, and we offer superior services combined with affordability and reliability. From a free inspection to a final walk-through, we do what it takes to get the job done well. Our highly trained and licensed technicians will customize a strategic plan for your home or business to rid the building entirely of your rodent pest population. There are also other ways to make positive pest identifications, and many of these methods are gleaned from our vast familiarity with the industry. All of our technicians are trained and certified, but also have a great deal of experience. This allows us to catch things that other, less experienced technicians might miss, leaving you and your family vulnerable to rodents. Turn to a pest control company that has been evicting rodents from homes and businesses for many years. As rodent removal experts, we offer real solutions to your pest problems and not just your empty promises. Enjoy a pest-free life when we provide customized treatment plans that cater to your pest control needs, as well as your budget. You won’t have to deal with interruptions of your daily life caused by the presence of rodents in your home or office building again. Our rat and mice control methods are humane to the animals, as well as safe for our customers. Our customer is always our focus, which is why we also pride ourselves on outstanding communication. We know it’s crucial to getting rid of unwanted pests on your property. In an effort to reach that goal, we staff bilingual exterminators to accommodate any of our customers who do not speak English fluently. To provide the most effective pest-control treatments, we need to know what particular rodent we’re dealing with. The methods we use for each vary. It is also important to know where exactly on your property you find these pests. We find many clues during our inspections which point to the answers of these questions, but as the home or office inhabitants, you are our best and most effective resource for locating the problem. Since we’re able to communicate with our Spanish-speaking customers, you can tell us what you have observed, and where you have predominantly observed those problems, without being concerned that we won’t understand. In other words, you don’t have to worry about language barriers becoming a complication that keeps the job from getting done in a timely or efficient manner. Our friendly technicians are able to communicate easily and prevent the frustration of miscommunication. This cuts down on the time it takes to perform an inspection, which in turn means we can begin the extermination treatment process sooner. As a thriving business in South Florida, we consider it our responsibility to have a Spanish-speaking pest exterminator to accommodate all of our customers. We understand if you are not fluent in English, it can be difficult to receive our assistance in this annoying and possible dangerous pest situation. We want to make sure you know our exterminator is standing by to help with your pest problem. Our friendly staff is happy to answer any questions you have and set up an appointment for a pest inspection that suits your schedule. During this inspection, we will ask you about the different types of pests you have found on your property and where they are located. Some bugs create nests while others tend to move about more, so we cannot fully understand the nature of your pest problem until the inspection is complete. With your help, however, we will pinpoint their location quickly and determine the best treatment to use. We go above and beyond to ensure that our services are personalized, as well as affordable. We'll dispatch a qualified technician to inspect your property for free. A one-hour pest control service is available after we complete your free inspection. Our solutions are customized to incorporate specialized techniques and highly effective treatment systems. Our mission is to keep your property protected and clean. Service contracts are not required, so you can call us whenever you need us, and at your own discretion. It’s our goal to ensure that all of our customers feel confident in their ability to schedule an appointment and communicate the exact nature of their pest problem. This cuts down on the stress our customers feel about their situation, as well as any stress about the process of getting rid of rodent pests. We keep you informed every step of the way, so you always know what we’ve discovered, and what we can do about it. 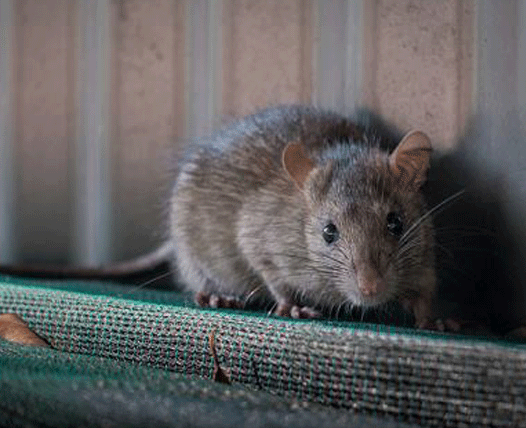 As certified rat exterminators, we understand the urgency of removing these dangerous pests. Not only are they dangerous to pets and small children because of their sharp teeth, their droppings and fleas create unsanitary environments which can cause disease to fester and spread. We want to be your family’s reliable solution, so you can sleep better and enjoy your home to the fullest. Contact us today to schedule your free inspection. We proudly serve customers with rodent issues in the surrounding areas of Miami Beach, Kendall, Homestead, Coral Gables, and Key Biscayne, Florida.